What color cabinets will go with my hardwood floors? In an email posted by a reader of this blog, the call for help with color for cabinets was asked. I found your blog and am very impressed with your kitchen designs.We are doing a new construction of a brand new home and am having trouble deciding on what color the kitchen cabinets should be to go with. We have decided on a flooring, it is Brazilian Cherry here is a sample of what it will look like http://www.brazilianhardwood.com/photogallery/braziliancherry/lamon.php We are going with Omega Dynasty Cabinets Anson style door. It would be great if someone could assist on a color for the cabinets. We are open to input, and suggestions, we are open to having the counter anycolor. Thanks! Dear Myron, thanks for reading my blog. Although I can’t answer your question directly without benefit of a design retainer, I think this is a good question in general that so many will face when selecting hardwood floors and cabinets in a kitchen. I can give you some points in general to think about. 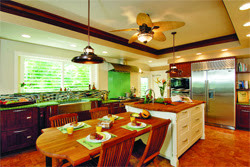 When deciding on color for cabinets consider the factors of the space. The amount of natural lighting: is the room dark? is it flooded with light? Does the room open up to a great room or is it separated from the rest of the house? 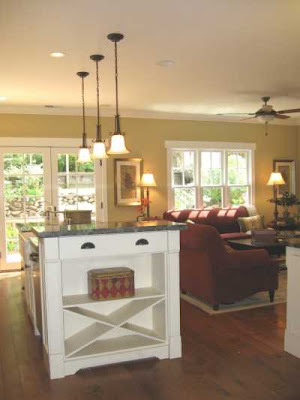 Are you looking to integrate the cabinetry to blend into the open space? In other words, the appearance of the cabinetry looks like furniture, blending with the entertainment center and other furnishings. What is the style of the house? What is it that you want to accomplish with the style? Do you want traditional, modern, contemporary? With the Brazilian cherry you can really play this up with anything from a complementary off white Painted cabinet color for a traditional look. For a contemporary influence tone on tone with a monochromatic color scheme is another direction. Additionally, are you prepared for the additional maintenance that goes along with hardwood floors? Do you have dogs that could potentially scratch your hardwood with their nails? Have you considered the warranty? And finally purchase responsibly. Make sure the flooring you are purchasing carries independent certification by an organization accredited by the Forest Stewardship Council. Ask about it before you buy. Do not buy woods from Endangered Forests. Check this list out. I always offer this true story example. I have a friend that owns a condo on Lely Barefoot Beach. Ten years ago they installed a beautiful American (considered very soft) cherry floor and in that time took extreme care of it by paying attention to care & maintenance. It looks as new as the day it was installed. The owner of the Brazilian Cherry floor had a very active adult household who didn’t clean up after themselves as much as the other family of four kids and a few pets. Today their floors need refinishing near high traffic areas and moisture sources such as the kitchen sink, refrigerator with icemaker. There are many colors and styles available today and we realize the choices can be overwhelming. If you’re sold on buying for hardness, do not be disappointed unless you live in a careful household. Next Post Is the ceiling fan the light fixture of choice for the male race?